The smart money is stubbornly refusing to chase the equity rally. 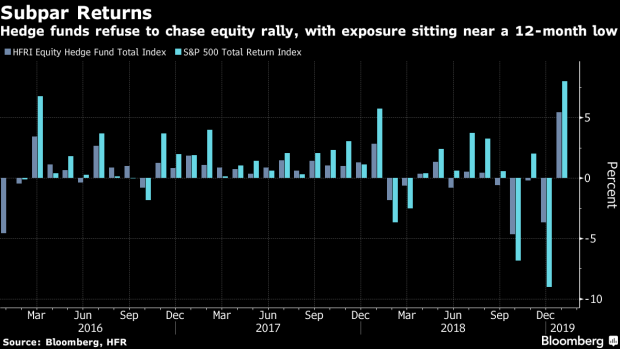 While U.S. stocks kept going up, posting their best January in three decades, hedge funds held to their cautious stance, trimming longs while boosting bearish bets along the way. At the start of this month, their net exposure as measured by the long/short ratio stood near the lowest level since at least last January, client data compiled by JPMorgan’s prime brokerage unit showed. The defensive posture highlights investors’ lingering unease, despite an equity rebound from last year’s sell-off. In their minds, the Federal Reserve’s willingness to slow monetary tightening may not be enough to offset a myriad of hurdles facing the market, according to Mark Connors, global head of risk advisory at Credit Suisse. The threat of Brexit is hard to ignore and a deadline for the U.S. and China to reach a deal without escalating a trade war looms in March. Meanwhile, corporate America is heading for a quarter of negative profit growth for the first time in three years. The inclination to cut exposure in the face of an equity rally has opened up a divergence similar to that seen last summer. At that time, the prevailing caution among hedge funds proved prescient as the S&P 500 peaked in September before plunging to the brink of a bear market. Right now, the reluctance to embrace stocks has been costly. Up 5.5 per cent in January, the industry’s returns as tracked by Hedge Fund Research was nothing bad. But in a month when the S&P 500 gained 8 per cent, their subpar performance marked the industry’s second-worst start of a year since 1997. Goldman Sachs’s prime brokerage unit highlighted a big miss in industrial stocks. While machinery producers and equipment manufacturers have beaten all other sectors in the S&P 500 this year, hedge funds continued to trim their holdings. Their long-short ratio fell to the lowest since April 2017. Another drag came from the conviction of their bearish wagers. According to Goldman Sachs, short sales by its clients outpaced buying by a ratio of 5-to-1 in January. That doesn’t bode well for performance in a market when shares are up. In fact, a basket of most-shorted stocks tracked by Goldman Sachs jumped almost 13 per cent in January, effectively the worst month for bears since 2010.